Hands-on review: Dr No-Effects Kafuzz!! In hopes of clearing up the distorted view of what exactly constitutes "fuzz" for guitarists, lets kick in the bypass switch. Then we'll talk about what I consider to be one of the best fuzz pedals on the market: DrNo-Effects Kafuzz!! A fuzz effect or ‘fuzz box’ is nothing more than a set of electronics that alters an audio signal until it is nearly a square wave, and while adding complex overtones by way of a frequency multiplier (an electronic circuit that generates an output signal with a frequency that is a harmonic of its input frequency). As simple as this seems in today’s technology, it was revolutionary when the American pedal steel guitarist Orville ‘Red’ Rhodes (1930-1995) fell upon the sound by accident when a faulty recording console preamplifier circuit produced a whacky fuzzy sound from Grady Martin’s guitar during the recording of Marty Robbins’ 1961 song Don’t Worry. Being the electronics wiz that he was, Rhodes developed the first fuzz box based on the console’s problem, which really wasn’t a problem since Rhodes recognized the potential with such an usual tone. Musicians, including The Ventures, began inquiring about the ‘new’ sound and Rhodes offered a fuzz box he made to the group, which they used to record 2000 Pound Bee in 1962. But it was in 1965, when Keith Richards used a Maestro Fuzz-Tone to record (I Can’t Get No) Satisfaction that the distinctive fuzz sound boosted fuzz pedal sales to the point of no return. During the 1960s several more groups and musicians used such devices, but it was Hendrix who set the standard, sometimes having 3-4 in a chain for that heavy thick fuzz sound for which he became known. I have a love-hate relationship with fuzz pedals because I found it difficult to locate one that sounds warm enough, yet clean so that all the notes remain distinctive. Many pedals give enough fuzzzzzz, but without the warmth it does not sound full-bodied. Conversely, several fuzzes I have tried lack that warmth; they almost sound metallic in nature and somewhat thin. Then recently I heard a sound clip of DrNo-Effects’ Kafuzz!! This is not a typical fuzz, but a European hand-made box with a high-end circuit board and silicon transistors to yield a higher gain and brighter sound. The Kafuzz!! has an amazing low end that is reminiscent of the older metal bands like Black Sabbath – it’s not an over-the-top ‘metal pedal,’ but classic in its deliverance and attributes. The low end is there, but it is a smooth fuzz that still maintains a nice fatness and quality distortion that refuses to muddy up a guitar’s tone. It puts the guitar player up front in the mix without being overwhelming or too blatant. Even with the fuzz pot on the lowest level, its character kicks in right away – fuzz from the get-go. And as you turn up the fuzz pot, the grind increases, but it’s also like adding a bass booster at the same time, producing a throaty growl that makes any guitar sound more full and in command. The tone control adds another element to the Kafuzz! !’s sound possibilities. With the tone all the way toward bass, and with an amp cranked, you can feel a heaviness pounding against your chest. Turn up the treble and the fuzz cleans up and cuts through better, yet remains gravelly and warm. You can sense the texture of that gritty fuzz as well as you can hear it, giving your tone that extra dimension. I was not surprised when I heard a thick tone with this pedal when using guitars with humbuckers, but the pedal adds surprising thickness even to single-coil pickups. In fact, the sound is so thick that it sounds as though you have added some type of doubler or harmonizer to your guitar. Compared to other fuzz pedals, this is the thickest I have experienced. Other pedals have different ‘grain’ characteristics, but this one has a huge bottom end and enough fullness to satisfy Tony Iommi. 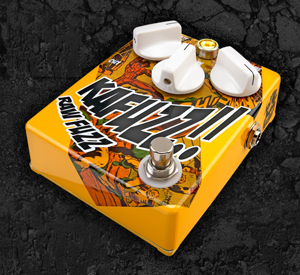 When playing power chords, it’s difficult not to get a surge of confidence with the Kafuzz! !, but it sounds silky and classic with lead guitar as well. When soloing, the tonal characteristics send you back to those early hard rock and metal sounds that were common with the psychedelic era, and you can hear why Hendrix, Cream and many others opted for a fuzz box within their arsenal. As raunchy as fuzz can be, there’s a haunting, hypnotizing and dreamlike quality to such an effect. And with the vintage, yet superior tone capabilities of the Kafuzz! !, this pedal is destined to become a modern classic. The DRNo Madfly can be purchased directly from DrNo for 199 Euro or from www.GuitarEffectsPedals.com, the exclusive US dealer, for $226.16.